In March of 2017, President Donald Trump made his first and only visit to the Washington headquarters of the Environmental Protection Agency. 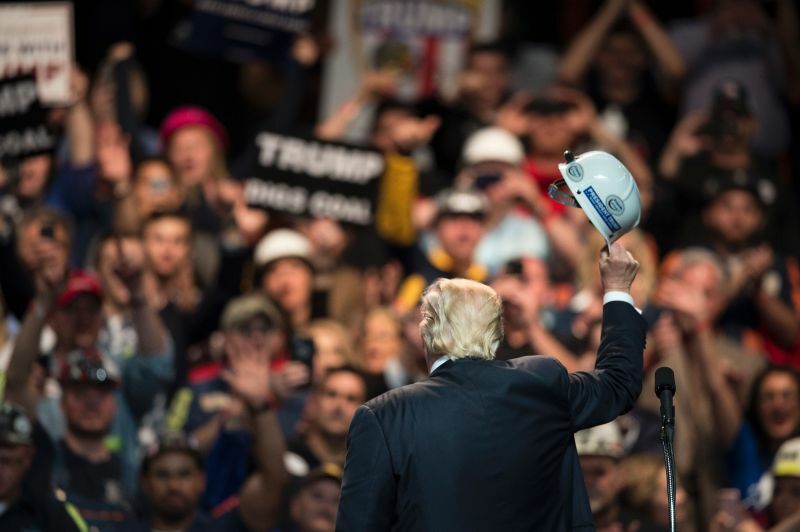 Accompanied on stage by coal miners and fossil fuel industry executives, the president signed an executive order aimed at dismantling an Obama administration initiative which sought to modestly reduce the nation’s carbon emissions. The gutting of Obama’s “Clean Power Plan” is just one phase of an ongoing “systemic assault” on environmental regulation – particularly of that relating to climate change – Christopher Sellers, a lead researcher at EDGI and a professor of history at Stony Brook University who specializes in environmental health, told The Globe Post. In one of his first acts as president, Trump withdrew the United States from the Paris Climate Accord, leaving the U.S. alone as the only country in the world refusing to be a part of the non-binding agreement. As scientists continue to warn of the looming existential threat to human civilization climate change poses without immediate intervention, Trump and his EPA have “moved away from the public interest and explicitly favored the interests of the regulated industries,” Sellers and his colleagues wrote in an article in the American Journal of Public Health. “To have four years of this – I mean the damage is just going to be tremendous. It’s basically an all-out attack on the regulatory state by private interests … and it’s on a historic scale,” Sellers said. In the case of the EPA, the agency has a statutory mandate to protect human health and the environment. While running for president, Trump declared he would destroy the EPA “in almost every form,” leaving “only tidbits” intact. Since becoming president, Trump has appointed two men to lead the EPA, both of whom have a history of hostility towards the agency and deep ties to the fossil fuel industry. Trump’s first pick for EPA administrator was Scott Pruitt, who had sued the agency 14 times while serving as Oklahoma’s Attorney General. In his first six months, EPA enforcement actions plummeted by 60 percent. Under Pruitt’s leadership, the agency sought to “undo, block or delay” 30 existing rules, including ones aimed at combating climate change and preventing public exposure to a pesticide linked to childhood development delays and autism. A “long list” of industry-connected political appointees joined the agency, while “disheartened” career staff resigned in droves. Pruitt dismissed many of the agency’s scientists, and for the first time in history, his EPA began allowing lobbyists to serve on its scientific advisory boards. In their April 2018 article in the AJPH, researchers from the EDGI’s “EPA Under Siege Writing Group” concluded that the EPA under Pruitt was verging on full-blown regulatory capture. “Although currently available evidence cannot prove regulatory capture, it does show an ambitious, intensifying movement to cripple the EPA’s capacity to confront polluting industries and promote public and environmental health,” they concluded. Sellers explained that researchers could not find “smoking gun” evidence of a direct quid-pro-quo agreement between industry lobbyists and EPA officials, noting a particularly high bar established in the political science literature to demonstrate an agency’s full capture. Further complicating the issue is that industry-friendly think tanks like the Heritage Foundation and the Competitive Enterprise Institute have blurred the line between the public interest and the interest of business. “There’s a whole sort of apparatus … a whole set of networks of people who do policy research and have the flavor of objectivity … and they just assume that what’s good for oil and gas is good for the country.” Sellers said. Lindsey Dillon, a sociologist at the University of California Santa Cruz who’s part of the EDGI research group, told The Globe Post it’s important to note that the issue of regulatory capture is not constrained to the Trump administration or the EPA. “The EPA has never not been under the influence of industry. That’s been a problem with the agency since the beginning, in different ways,” she said, adding that the problem has simply intensified significantly under Trump, becoming “distinctly different” than under previous regimes. In July 2018, Pruitt resigned from the EPA after a series of bizarre public scandals marred his tenure as administrator. His deputy, Andrew Wheeler, a former coal and chemical industry lobbyist, assumed the reins and has been running the agency ever since. Before being appointed as the EPA’s deputy administrator, Wheeler was a lobbyist with Faegre Baker Daniels Consulting – a firm that until last week represented notorious Coal Baron Bob Murray’s company, Murray Energy. Murray is a passionate supporter of Trump and has appeared on numerous cable news programs defending him. His company donated $300 thousand to the president’s inauguration as well as $1 million to pro-Trump PACS during the 2016 campaign. In a March 2017 memo sent to the Department of Energy that was obtained by Senator Sheldon Whitehouse and shared with The New York Times, Murray detailed a “wish list” of policy proposals he’d like to see implemented by the Trump administration, many of which had to do with rollbacking EPA rules and regulations. Included in the memo were requests to cut the EPA’s staff “at least in half,” “eliminate” the Clean Power Plan, repeal subsidies for renewable energy and mine safety rules, and withdraw the U.S. from the Paris climate agreement. This was the secret March 29, 2017 meeting about the plan to bail out coal. Much of Murray’s requests ended up being fulfilled by the Trump administration. In addition to the U.S. withdrawal from the climate agreement and the repeal of much of the Clean Power plan, the EPA’s staff has been reduced to the lowest point in history and dozens of environmental regulations have been gutted or are in the process of being reviewed. Judith Enck, a former EPA regional administrator, told HuffPost this week that Murray Energy likely dropped their lobbying firm because it’s no longer necessary to have one. Wheeler is still in the process of being confirmed as Pruitt’s full-time replacement as EPA administrator. And though there’s been significant opposition to his nomination, he’s still expected to be confirmed by the Senate relatively easily. During his confirmation hearing on January 16, Wheeler said he does not believe that climate change is the “greatest crisis” facing the planet, though he conceded that the issue is of importance. Under Wheeler’s leadership, the EPA has continued to largely carry out the same pro-industry agenda implemented by Pruitt, Sellers said. Enforcement actions have continued to drop dramatically, reaching historic lows in 2018. That subtlety is “dangerous,” Dillion said, because it draws less scrutiny and media attention, allowing Wheeler’s agenda to move forward with less opposition. While the consequences of that agenda may be global in scale when it comes to climate change, the burden of the Trump administration’s overall mission to reduce environmental protections will be disproportionately felt by already vulnerable marginalized communities, the EDGI researchers warned. Historically, Jim Crow, segregation, and federal housing discrimination resulted in poorer, mostly African American communities being subject to greater risks of pollution and environmental hazards, Dillon and Sellers explained. The EPA’s Office of Environmental Justice was established specifically to try to remedy those communities environmental grievances. The status of that office, however, has been downgraded under the Trump administration, making it less powerful and effective. In the summer of 2016, as the so-called Islamic State was in retreat across northern Iraq, the sky around the small city of Qayyarah began to fill with black clouds. The residents of the area – as well as the internally displaced people living in a nearby camp set up by the United Nations – would not see the sun again for eight months. As ISIS retreated, they set fire to the region’s oil wells and booby-trapped the surrounding area with explosives, making it difficult for the advancing government forces to put out the blazes. As Iraq continues to rebuild after the war with ISIS, environmental pollution, an often overlooked consequence of conflict, threatens the public health and future security of the country.